2016 Aprilia Caponord 1200 Rally. Picture credits - Aprilia. Submit more pictures. Front brakes: Double disc. ABS. Floating disk. Brembo M432 monoblock four-piston radial callipers. Rear brakes: Single disc. ABS. Brembo 34 mm single piston calliper. Comments: Ride-by-wire multimap, cruise control, ABS can also be disabled, height adjustable windshield. Ask questions Join the 16 Aprilia Caponord 1200 Rally discussion group or the general Aprilia discussion group. Bikez has reestablished Bikez.info motorcycle web shop overview. Here we present the major online shopping possibilities for motorcycle parts, gear and accessories. This includes customizing and insurance. Search and compare products and prices. 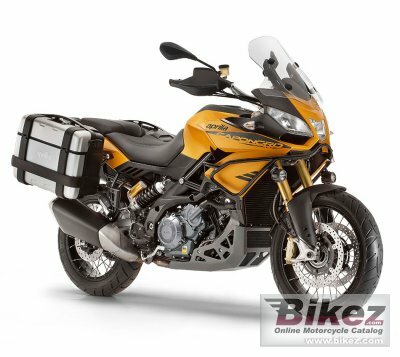 Try our 2016 Aprilia Caponord 1200 Rally discussion forum if you have questions or comments. Information about any technical issue is always welcome.